Since April of 2011 when President Obama signed Executive Order 13571 mandating agencies improve the quality of service they give to the public, agencies have been working through strategies to best fulfill this task. We at GSA’s Office of Citizen Services and Innovative Technologies (OCSIT) were no exception. Back in September of 2013, we wrote a blog about how important it is for a Customer Experience (CX) Program to have shared principles and values, as well as understanding who our customers are and their expectations. 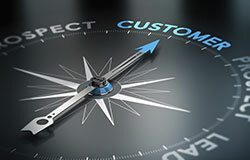 Just recently I attended Forrester’s Forum for Customer Experience Professionals and picked up a few more tips to share about building a “customer centric” culture. Gained Senior Leadership Buy In. We outlined our vision, goals and priorities for CX in FY14 to ensure understanding and agreement with our CX roadmap for our first year. We developed a Customer Experience Charter, disseminated it to all in our organization to ensure understanding of the importance of customer experience in all our programs and services. Customer Experience posters—The posters highlight our mission and principles and we have them displayed in visible common areas. Bi-weekly emails—Through email we share white papers, videos and blogs that highlight customer experience information important to our office. Customer Experience Value cards—“Business cards” that are highly portable and an easy way to share and remember the vision, mission and values of our OCSIT CX program—wherever you are! Incorporated CX updates into our quarterly All Hands Meetings, attended by all staff. Learning Series Sessions—Quarterly, one hour training/educational forums where a subject matter expert shares information around a topic that meets the customer experience information needs of OCSIT. Example: We recently used this session to highlight our GCXi (government customer experience index) results where our agency customers rated their satisfaction with our services. One of our colleagues shared with the group how she used feedback from 2013 to enhance her program. For 2015 we look forward to enhancing what we are doing now by getting tips from experts and asking our colleagues what ways they like to receive customer experience information. As you take these tips to help enhance your “customer centric” culture for the rest of 2014 and into 2015 what tips do you think are the best to implement now? Jacqueline Snee is a Information Program Manager in the Office of Citizen Services and Innovative Technologies (OCSIT) at the General Services Administration.